Well, here it is folks. My second level has arrived! Man this one took a long time. Editing level one of episode one was a piece 'o cake compared to this. Anyway, unlike my last level, this level doesn't have screwed up difficulty levels. Ultra-Violence is ultra-violence. If you want to play nightmare-it will be. Try using the -respawn option at the doom command line and use one of the easier settings if you want to simulate nightmare-but still have a chance at winning. If enough people prompt me to make a nightmare version, I will. Once again the level went through rigorous play-testing. You can get out of all areas. So if you're having trouble finding stuff, start banging on walls. WARNING! Nagivating through this level is not easy!! Finding all the keys won't be easy. I don't believe in laying keys out in front of a player. Whats the point then? In keeping with iD's wishes, only registered users will be able to enjoy this level, because it is for episode 2, and level 2 to be exact. DOOM is truly the best computer game ever created, so please register! DOOM is a registered trademark of iD software. I used Deu version 3.41 and above for the all of my editing needs on this level. No other editor is as intelligently designed. Go Raphael! Go! The E2L2_gg1.wad file should wind up in your Doom directory if you wish to use the Run_22gg.bat. It will look for it there. Change the batch file if you want to keep the .wad somewhere else. Run_22gg.bat will enter development mode and warp you to this level. You must enter the skill level, however from 1 to 5 after the run_22gg.bat. If you enter in any other values, Doom will spit you out to DOS. To run my level on Skill 4 you would simply type "run_22gg.bat 4". Wala! The game will enter using skill 4. If you don't want to run the level directly, say if you want to run through level one first, you'll need to enter in some stuff on the Doom command line. Wala! The level will be appended in memory only, so no tampering with the .WAD is required. Everything else in the zip is unneccesary, although it adds to the flavor of my level. Newwalls.zip will add a few new wall graphics in your doom.wad using dmgraph.exe, if you have it. If you don't have dmgraph, snag it off of wuarchive from the pub/MSDOS_UPLOADS/games/doomstuff directory. 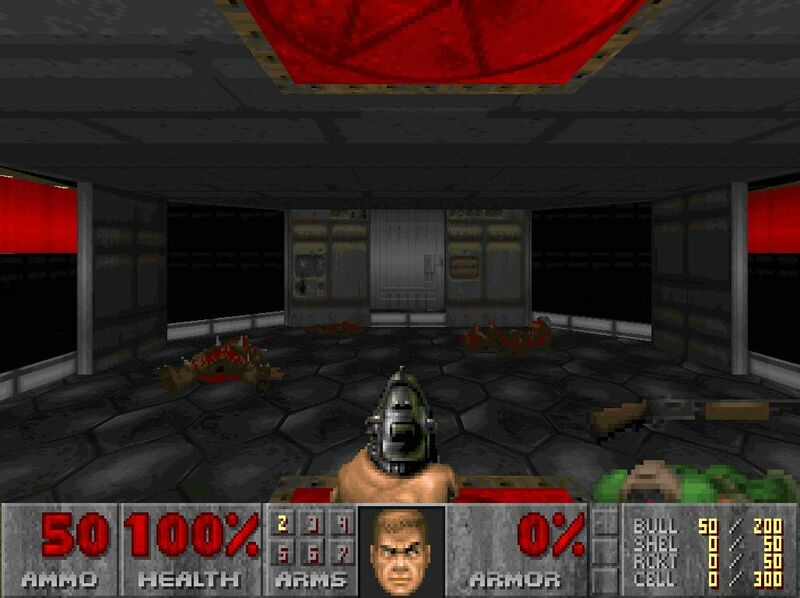 That program will let you put new graphics into the doom.wad file without re-writting the whole thing. Included in the zip are 2 batches, one that will save the original images and place in the new ones. Then there is a batch that will restore the .wad. This zip will need to be unpacked in the doom directory in order for the batches to function. Imp_grfx.zip has some new animation for the imp. It also requires that you have the dmgraph as well. There is a batch file which will save the images currently in your doom.wad and place in the new animation. There is also a batch that will restore the .wad to the way it was found. Dmgraph.exe must be in your doom directory for the batches to run. This zip will need to be unpacked in the doom directory in order for the batches to function. NOTE: although I have tested these batches, you may find some way of screwing up your wad file. Back it up if you're squimish. NOTE #2:  all the new graphics were drawn by ME! I couldn't be satisfied with the gore in DOOM, no, no! More gore!!! More gore!!!!! Well, that's it (I hope)! PS: If for some stupid reason your computer decides to blow up, or perform any other neato-computer-malfunction while using my level, I am in no way responsible! Nuff said!